MONROE, La., Nov. 1, 2017 /PRNewswire/ -- CenturyLink, Inc. (NYSE: CTL) has completed its acquisition of Level 3 Communications, Inc. The combination of CenturyLink and Level 3 creates a leading global network services company capable of providing customers a wide range of high-quality technology solutions over a secure and reliable fiber-rich network. 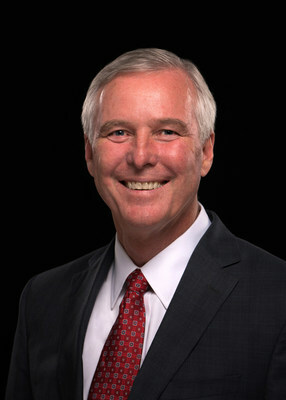 The combined company, with estimated pro forma revenue of $24 billion for the trailing twelve months ended June 30, 2017 (excluding revenue related to CenturyLink's May 1, 2017, colocation business sale and including estimated intercompany eliminations and purchase accounting adjustments), anticipates that approximately 75 percent of its core revenue will come from business customers and nearly two-thirds of its core revenue will come from strategic services. 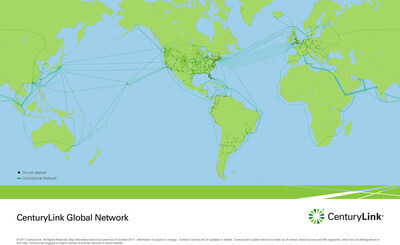 CenturyLink's network now connects more than 350 metropolitan areas with more than 100,000 fiber-enabled, on-net buildings, including 10,000 buildings in EMEA and Latin America. 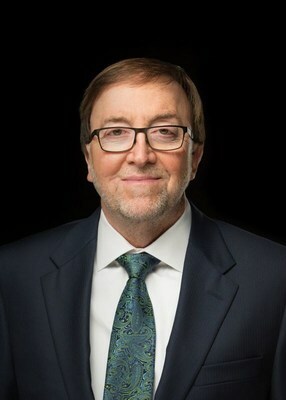 "CenturyLink is now poised to offer an expanded, robust portfolio of communications solutions focused on our customers' networking and IT services needs," said Glen F. Post III, CenturyLink's chief executive officer. "Our customers, from individual consumers to global enterprises, will benefit from our expanded, innovative network solutions, our complementary managed services and our highly talented workforce." "Our goal is to be the world's best networking provider and we have the ability to achieve this as one company," said Jeff Storey, CenturyLink's president and chief operating officer. 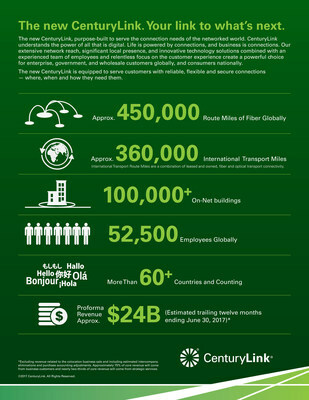 "CenturyLink is focused on providing a differentiated experience for our customers, while driving profitable growth and increasing free cash flow per share. Our scale and experience will enable us to deliver on behalf of our customers, employees and our shareholders." Except for the historical and factual information contained herein, the matters set forth in this communication, including statements regarding the expected benefits of the combination, such as efficiencies, cost savings, enhanced revenues, growth potential, market profile and financial strength, and the competitive ability and position of the combined company, and other statements identified by words such as "will," "estimates," "anticipates," "believes," "expects," "projects," "plans," "intends," "may," "should," "could," "seeks" and similar expressions, are forward-looking statements within the meaning of the "safe harbor" provisions of the Private Securities Litigation Reform Act of 1995. These forward-looking statements are subject to a number of risks, uncertainties and assumptions, many of which are beyond our control. These forward-looking statements, and the assumptions upon which they are based, (i) are not guarantees of future results, (ii) are inherently speculative and (iii) are subject to a number of risks and uncertainties. Actual events and results may differ materially from those anticipated, estimated, projected or implied in those statements if one or more of these risks or uncertainties materialize, or if underlying assumptions prove incorrect. Factors that could affect actual results include but are not limited to: the possibility that the anticipated benefits from the combination cannot be fully realized or may take longer to realize than expected; the possibility that costs, difficulties or disruptions related to the integration of Level 3's operations with those of CenturyLink will be greater than expected; the ability of the combined company to retain and hire key personnel; the effects of competition from a wide variety of competitive providers, including lower demand for CenturyLink's legacy offerings; the effects of new, emerging or competing technologies, including those that could make the combined company's products less desirable or obsolete; the effects of ongoing changes in the regulation of the communications industry, including the outcome of regulatory or judicial proceedings relating to intercarrier compensation, interconnection obligations, access charges, universal service, broadband deployment, data protection and net neutrality; adverse changes in the combined company's access to credit markets on favorable terms, whether caused by changes in its financial position, lower debt credit ratings, unstable markets or otherwise; the combined company's ability to effectively adjust to changes in the communications industry, and changes in the composition of its markets and product mix; possible changes in the demand for, or pricing of, the combined company's products and services, including the combined company's ability to retain customers and effectively respond to increased demand for high-speed broadband service; changes in the operating plans, capital allocation plans or corporate strategies of the combined company, whether based on changes in market conditions, changes in the cash flows or financial position of the combined company, or otherwise; the combined company's ability to successfully maintain the quality and profitability of its existing product and service offerings and to introduce new offerings on a timely and cost-effective basis; the adverse impact on the combined company's business and network from possible equipment failures, service outages, security breaches or similar events impacting its network; the combined company's ability to maintain favorable relations with key business partners, customers, suppliers, vendors, landlords and financial institutions; the ability of the combined company to utilize net operating losses in amounts projected; changes in the future cash requirements of the combined company; and other risk factors and cautionary statements as detailed from time to time in each of CenturyLink's reports filed with the U.S. Securities and Exchange Commission (the "SEC"). You should be aware that new factors may emerge from time to time and it is not possible for us to identify all such factors nor can we predict the impact of each such factor on the combined company. You should not place undue reliance on these forward‑looking statements, which speak only as of the date of this communication. Unless legally required, CenturyLink undertakes no obligation and expressly disclaims any such obligation, to update publicly any forward-looking statements, whether as a result of new information, future events, changed events or otherwise.